It's been far too long since I've done a post like this, so I thought it would be fun to share what I'm currently loving as well as all of my outfit details from my recent Instagram posts. It's a pretty extensive round-up, so if there's a particular outfit you've been wondering about or maybe had some questions on, this post is for you! If there are any other past outfits you've been wanting details on, please let me know and I'll be happy to share those, too! 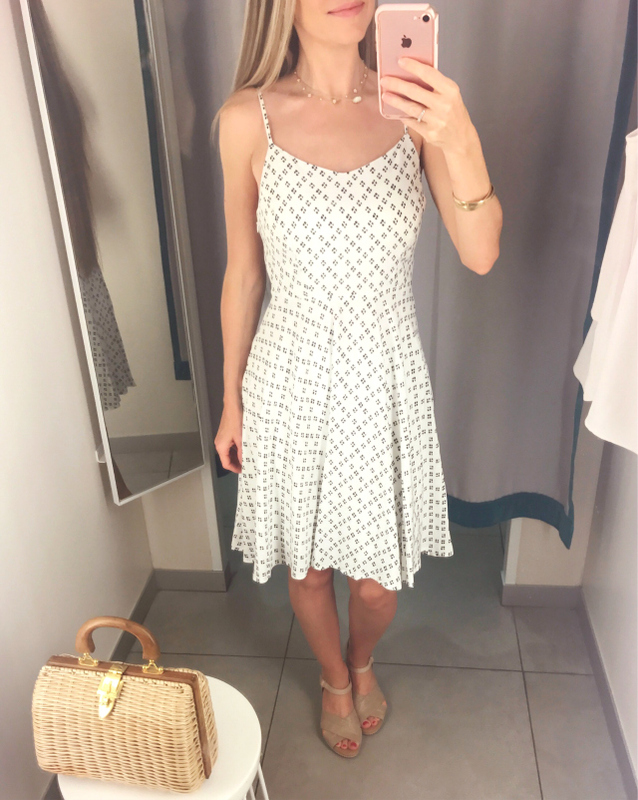 I'm also taking this opportunity to sneak in a few fitting room reviews from recent try-on sessions in this post, especially since things always seem to sell out so quickly. Okay, so let's jump right in! As far as sizing goes, Asos sizing is known to run small compared to American brands, so you may wish to size up 1 size, especially if you're in-between sizes or have a larger bust. I sized up to a 2 from my usual size 0 in this top and it fits comfortably and is petite-friendly. Sizes 0 - 14 are available and fully stocked! Overall, I adore this top and have already received tons of compliments/questions on it! I'm loving these two other shoulder-tie tops below, too, and they're both super-affordable at around $20 each! Okay, let's just take a minute to swoon over this blush, satiny goodness, shall we? Are these not some of the prettiest sandals you've ever seen? 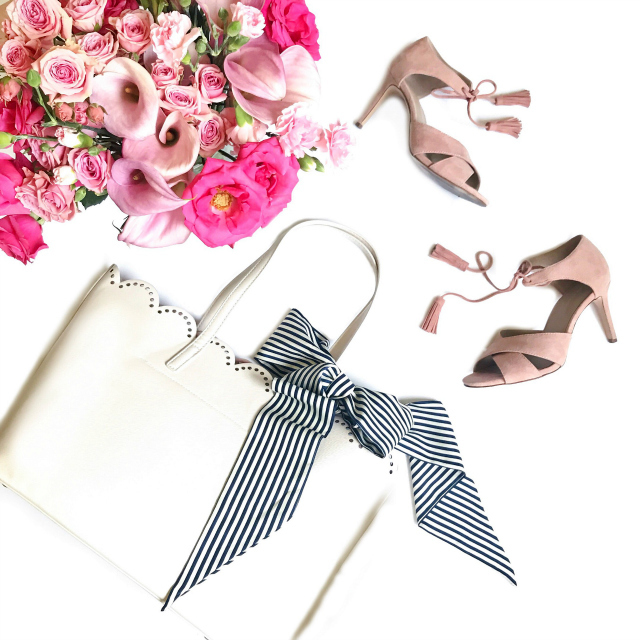 If you love bows, ankle ties, and all things blush and feminine like I do, you need these sandals in your life stat! Ann Taylor really nailed it again with these lace-up bow sandals -- I can't stop staring at them! Love, love, love! Yes, I have far too many pink shoes, but who's counting? ;-) I couldn't pass these up. And thanks to the many sale promos AT runs, I was able to nab these at 40% off last week! I can't speak to the sizing or comfort just yet, as they're scheduled to be delivered in a few days, but I'm hoping they're the perfect fit! I took my usual AT shoe size of 5.5, and I can tell you right now: the smaller sizes are always the first to go, so if you have smaller feet and love these, don't wait too long or they'll be gone! They come in sizes 5 - 11, and come in this "angel pink" color and also black. So darling! 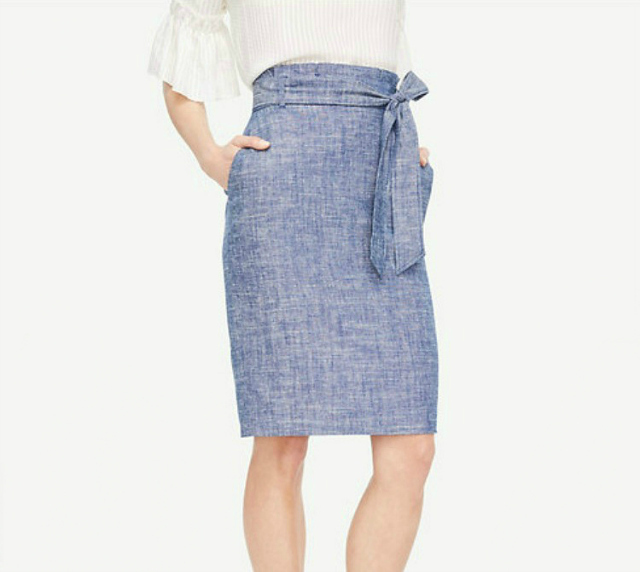 I've also had my eye on this chambray paper bag skirt at Ann Taylor for awhile now. I love this one as well as the seersucker one in the same style, but ultimately chose this one for the color. I added it to my cart but procrastinated on buying it and, of course, my size sold out in a hot minute. I bookmarked it and kept checking for re-stocks, and was happy that a size 0 popped back. Size 00 would've been more ideal, but I'm hoping I can just cinch the waist of the size 0 for a snug fit...we'll see. I can't complain since I scored it at an additional 60% off during the flash-sale promo that was running last week, bringing it to only $32! The occasional sizes keep popping back in both paper bag skirts, so keep checking online or ask customer service to try locating one in-store. They're currently 60% off again, so snag one if you can! 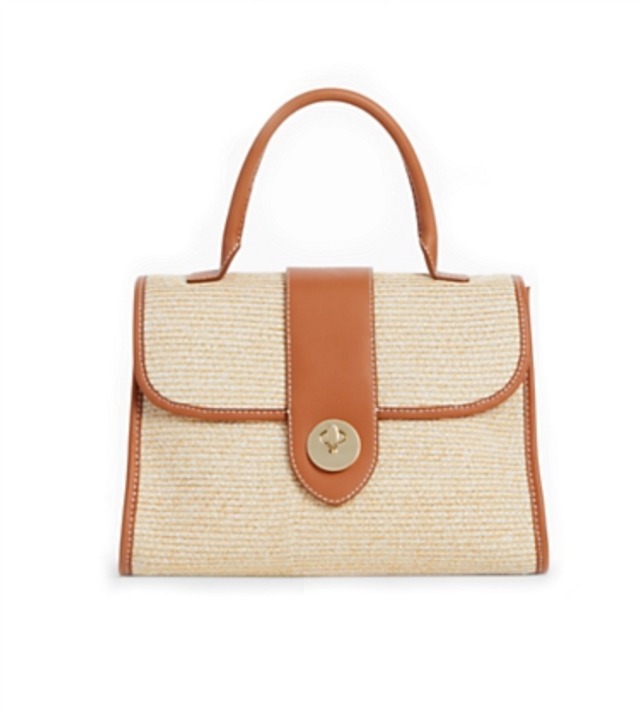 I recently added this two-tone straw satchel to my collection and couldn't be happier with it. I was ecstatic to finally receive it after a month of waiting! I shared this on my Instagram stories, but for those of you who missed it, here's the brief back-story: I ordered this bag last month and kept waiting for a shipping confirmation that never came. I finally called Talbots' customer service line to inquire on it and was told there was no record of my order. After much frustration and forwarding them my PayPal transaction email for reference of the order, their team researched it and determined my order had inadvertently never processed and fell threw the cracks, so to speak. As it turned out, they'd been experiencing several glitches with their PayPal check-out system, which likely caused the mishap since I had paid with PayPal. Talbots informed me they've since done away with the PayPal check-out feature, and their customer service team generously offered me an additional 15% price adjustment on my order. They also reversed the shipping charges to make up for the inconvenience, which I really appreciated. So despite the hassle, it ended on a positive note. Now, back to the bag itself -- I love so many details about it: the camel-colored leather trim, the gold toggle clasp, and the structure/shape of it. 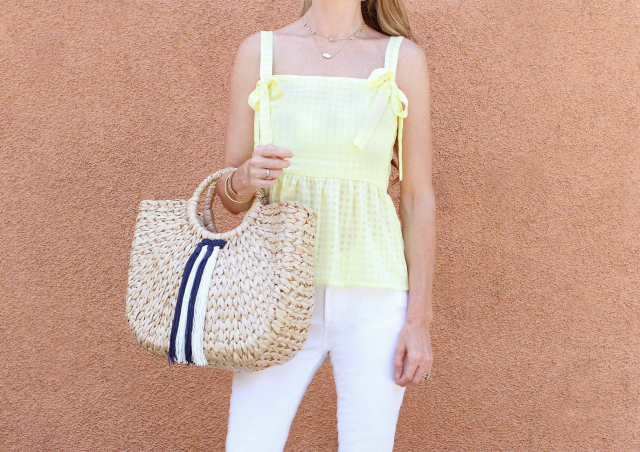 It's such a great, classic bag that's not only perfect for Summer, but year-round. It's also currently on major sale for $50 (original retail: $150) and comes in 3 solid colors, all in pebbled leather: a pretty pink "khaki rose," a camel color "spring sienna," and black. They're all beautiful, versatile bags. Shop the other colors here. 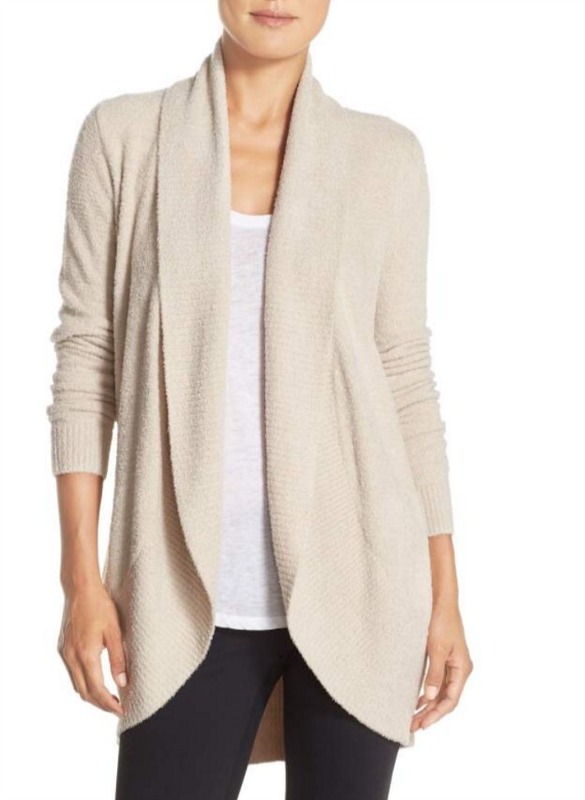 Barefoot Dreams Circle Cardigan in "stone"
This circle cardigan is one of the few items I purchased from the current #NSale. I've been wanting a long, drapey cardigan in this neutral color for awhile now, and have heard nothing but glowing reviews on this one. It's supposed to be one of the softest, most cuddly sweaters out there, which is apparently notorious for this brand, Barefoot Dreams. With the backlog of online orders due to the sheer craziness of this sale, I'm still waiting on this cardi to arrive in the mail. I'm hoping it lives up to all the hype! I ordered the size XS/S, which appears to be sold out again, but keep checking back because I just noticed other sizes starting to pop back. I popped into my local H&M store a few weeks ago. It had been quite awhile since I'd shopped there, and I thought, "what the heck? Let's have a look." I'm so glad I did because I actually walked away with some really cute pieces that were all around $20 - $30! If you haven't shopped there in awhile, you should give them a try! They tend to offer more trendy styles, but you can find some great hidden gems there if you're patient enough to cull through the endless sea of clothing racks. 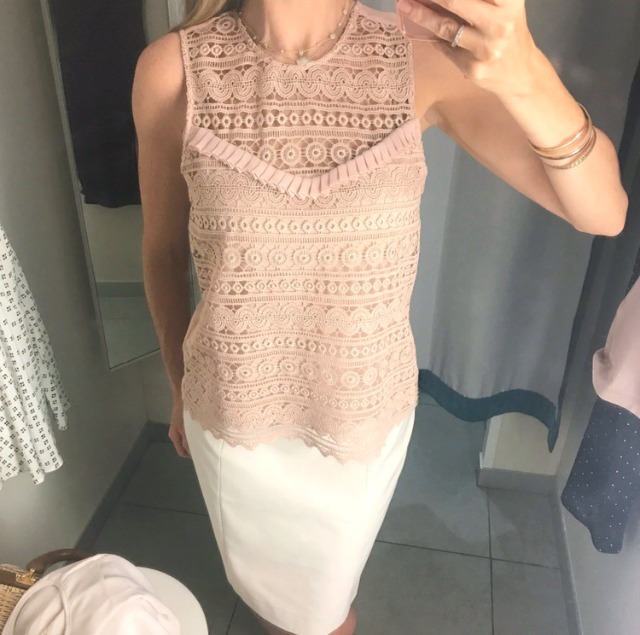 Again, if you follow me on Instagram, you've already seen a few pictures of this gorgeous, sleeveless lace blouse in "powder pink" (top left) that I had tried on. The lace is really detailed and looks far more expensive than the $13 price tag might suggest. The pleated ribbon trim along the front is also really pretty and feminine. This top was definitely one of my favorite unexpected finds that day and came home with me. Love and recommend! I also spotted this fitted, blue, button-down dress shirt with tiny polka dots. It was the only one on the sale rack and actually fit me perfectly! Don't you just love when that happens? At only $7 (yes, $7! ), it was a no-brainer and came home with me, too. This exact one appears to be sold out online (darn it), but I found the same style in a striped version, which I linked above. 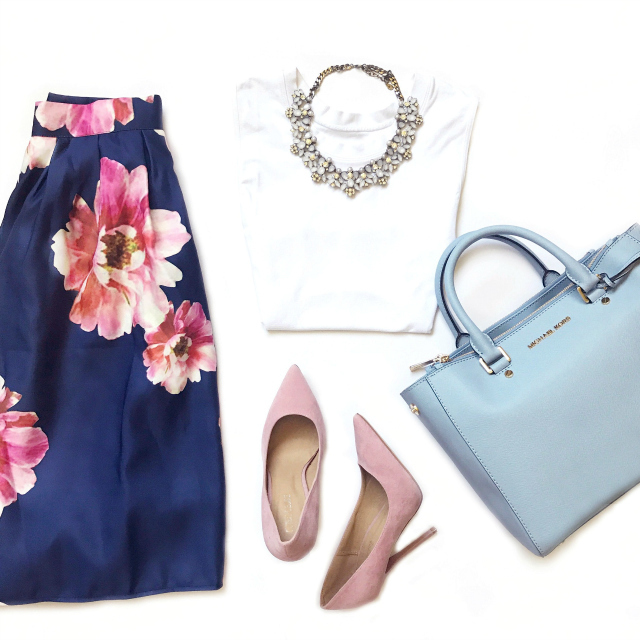 It's a great office wardrobe staple! This jersey blazer was another unexpected find. It's not very structured but still fitted and flattering on. The jersey material is super soft and feels like you're wearing a sweatshirt. The striped lining is also a cute touch. Roll up the sleeves to let it peek through for a more casual look or leave them unrolled for a dressier look. At only $34.99, I snagged it. The color is a warmer beige -- almost blush -- and comes in a grey color, too. Lighting is a bit wonky in the fitting room, skewing the color a bit. The photo below is a better color representation. 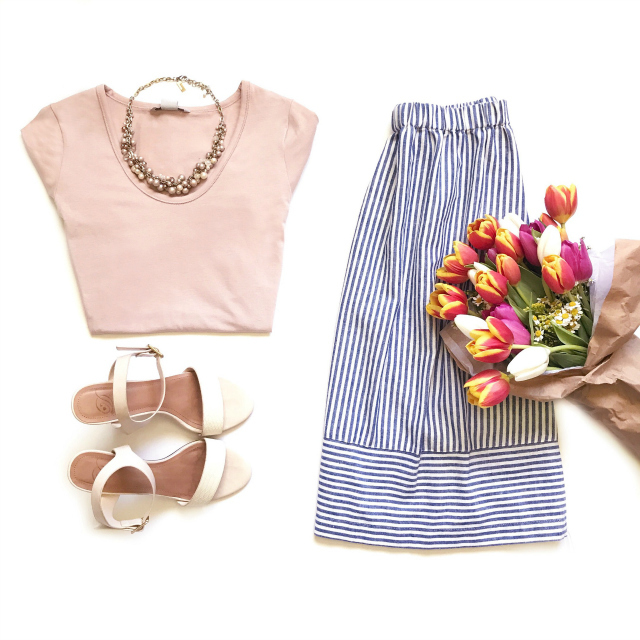 If you're looking for an affordable office outfit for Summer, try this one! I love the soft colors and the pretty, feminine details, especially in the lace-inset blouse. This is the jersey blazer I shared above. I'm wearing size 2, which fits closer to a size 0. The arms and shoulders are fitted and the jacket falls to my hips. It's definitely a longer style, but still looks polished and professional. I love it paired with white skinny jeans, too. It's such a lovely blazer! This light beige pencil skirt also surpassed my expectations. It hugs your curves without looking inappropriate for the office, and it's fully-lined and only $13! Crazy! I had to double-check the price tag because I thought I read it wrong. (lol) This is a nice, classic pencil skirt for an amazing price. Several sizes in this color have already sold out online (not surprising), so if your size is sold out, check your local store to see if they can locate it for you. It also comes in black and navy -- perfect neutral colors to mix and match with your favorite tops. Speaking of tops, I grabbed this v-neck blouse to try on with the skirt and ended up really liking it! The cream color and the lace-inset detailing are really pretty. The only downside is that the v-neck of the blouse is cut a little too low for my preference, which means that if you're not careful, the lace will reveal too much. This can be easily fixed by a tailor by raising the shoulders a bit, though. I'm trying on a size 2 here, but it runs a little large since it's meant to have a looser, drapey fit. Size down one size if you can on this one. This bubble gum-pink pleated dress was also a fun find! I adore the color and the easy, pull-on styling. Just throw it on and go. I always reach for dresses like this in Summer since they're lightweight and fuss-free. This one drapes nicely and flares out ever so slightly. It runs a little longer on me (I'm 5'2" and it hits about an inch below my knee) so I just tucked some of the fabric under the elastic waist to shorten it a bit to my liking, which is right at the knee. Easy-peasy. 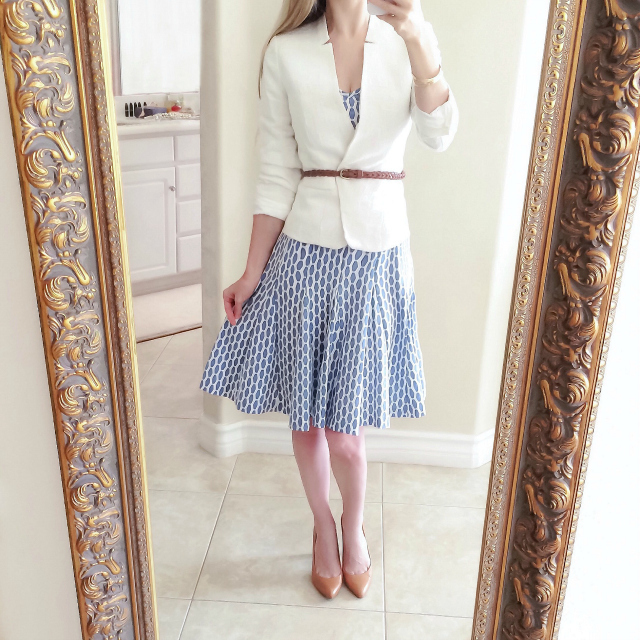 This dress looks really cute belted, too. 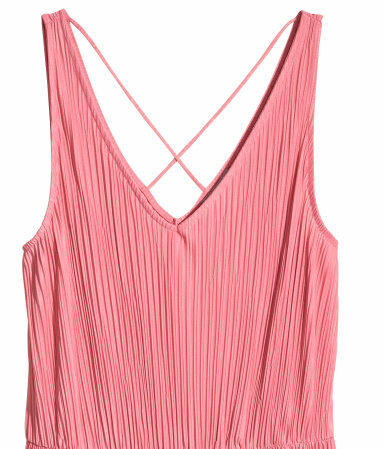 I also love the wide straps and the criss-cross straps in the back (see the below photo) which conceal your bra straps. No special bra needed! It is unlined and slightly sheer, so you'll need to wear a slip under it. It's 100% polyester, machine-washable, and it's currently on sale for only $25! Another keeper! Here's a close-up of the cute criss-cross straps in the back. Love! I wasn't expecting much from this sleeveless shirt dress but liked the stripes so I decided to give it a try. Once I threw it on and cinched the waist belt, I actually really liked it, too! It's another easy dress to just throw and go. It's light and airy and has small side slits on the sides (shirt-hem style.) This exact color appears to be sold out online, unfortunately, but I linked the same dress in blue above, which is only $24.99 and available in very limited sizes. You may have better luck finding this one in your local store. 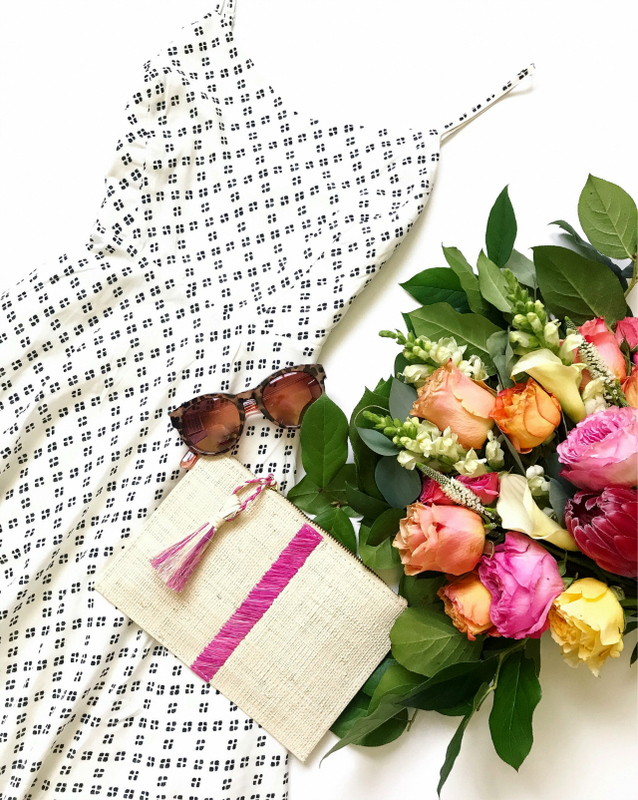 It's another great, lightweight Summer dress! I've also been on a Summer scarf kick lately. I'm loving all the colorful florals, fruity prints and other playful details like tassels and fringe trim that are popping up everywhere right now. 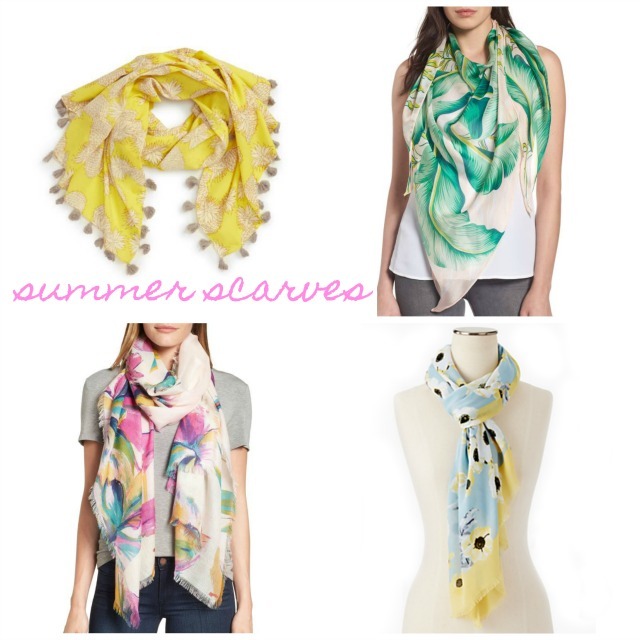 Summer scarves are the perfect accent piece and can quickly liven up even the most basic outfit. 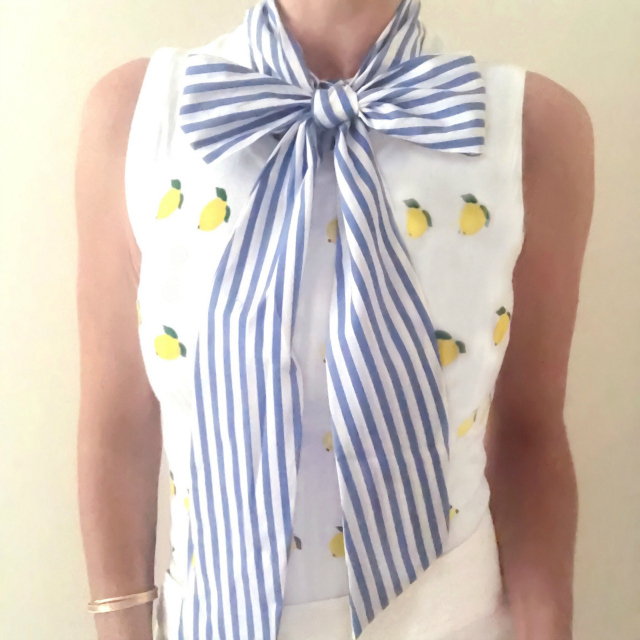 Style it over a little white dress or over a simple tee with your jeans or tie it to your handbag for an extra pop of color and touch of whimsy. Here are a few scarves that I'm eyeing. Palm prints, watercolor florals and tasseled pineapples? Yes to all of them! I've also been drooling over the many gorgeous lace pieces from the brand, AQUA. 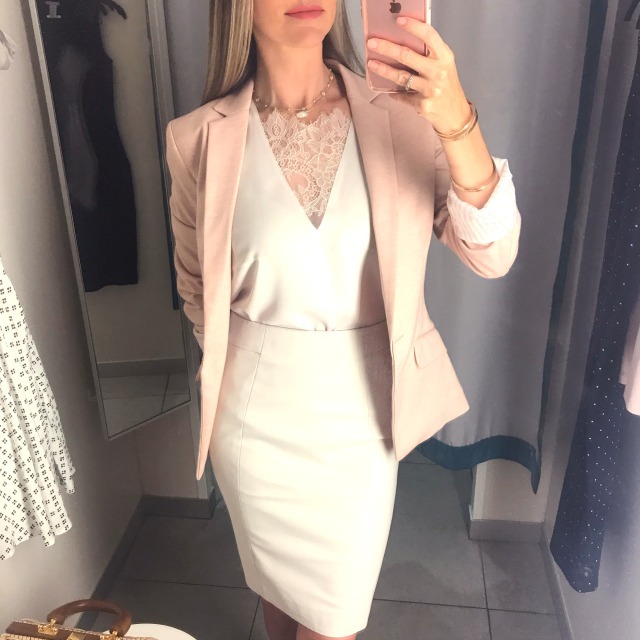 If you're not familiar with this brand, I'm thrilled to introduce you to it because it offers some of the most stunning, intricate lace pieces, as well as a full range of other modern, feminine women's clothing, jewelry and accessories, and even kids' clothing (don't get me started on the little girls' clothes -- they're equally darling!.) It's definitely worth a glance. The lovely lace pieces shown below are some of my current favorites, with several exclusive to Bloomingdale's. I find that Bloomingdale's has the best selection of AQUA items hands-down, leaving me indecisive on which ones to get! 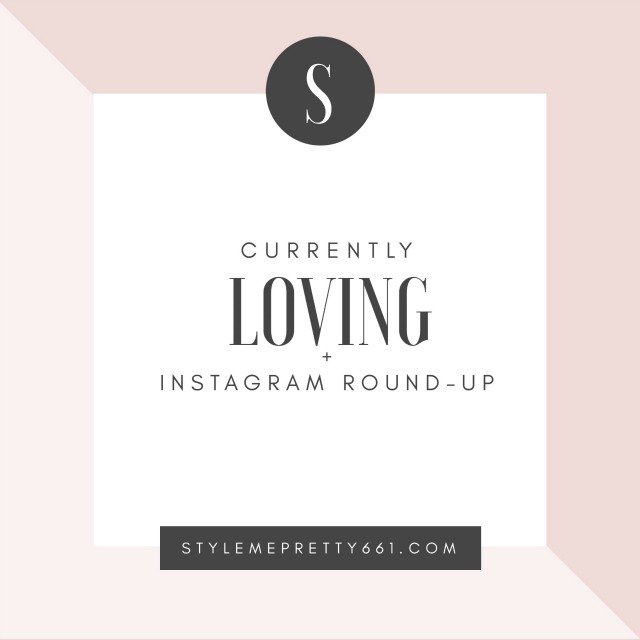 Now on to the Instagram round-up! I hope you found these helpful! Feel free to also visit the "Shop the Look" page here on the blog for more daily Instagram photos and all corresponding outfit details. I'd love to hear which items you're currently loving, too -- leave me a comment below to share your picks! Also, a friendly reminder: this is the final week of the Nordstrom Anniversary Sale, so be sure to make your final shopping rounds before prices go up! Several of my #NSale picks are still in stock -- see my previous blog post for my Top 25 Picks as well as my bonus beauty picks/value sets, and more! Thanks so much for stopping by, and I hope you have a great start to your week!